What is UVT Acrylic Ultraviolet Transmitting Rod? UVT Acrylic Ultraviolet Transmitting Rod has unusual optical clarity, excellent light transmission and outstanding weatherability. It is unaffected by sunlight, resists aging and maintains good stability under variable condition of heat, cold, moisture and other exposure.UVT Acrylic Ultraviolet Transmitting Rod will not warp, crack, craze or corrode. Because it is more optically perfect and fabricates and machines better,UVT Acrylic Ultraviolet Transmitting Rod is half the weight of comparable glass, and has good shatter resistance and excellent durability. Acrylic polymers are among the most light-stable transparent plastics. This is largely due to their exceptionally low absorption of light. They are almost totally transparent to all visible light and to long wavelength ultraviolet light (UV light with wavelength greater than 290 nanometers). There are two general types of clear acrylic: UVA (ultraviolet absorbing) and UVT (ultraviolet transmitting). UVA has additives incorporated within the polymer which block out most ultraviolet light. 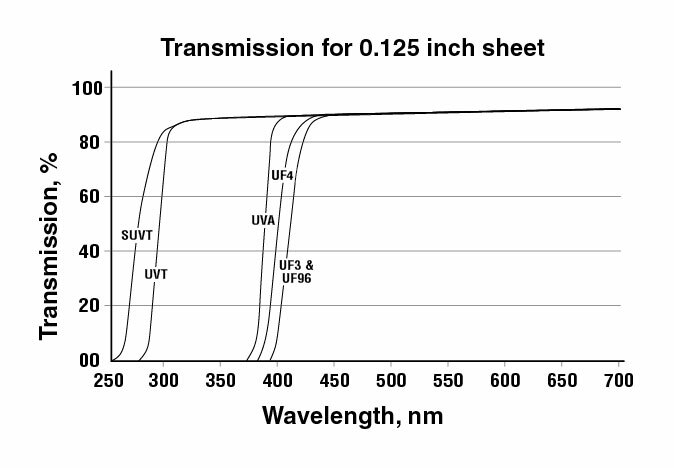 UVT has no ultraviolet filtering chemicals, therefore it transmits ultraviolet light as low as 290 nm. What is UVT Acrylic material? Due to their chemical structure acrylics absorb, and as a result are opaque to UV light below 290 nm. It is this characteristic which makes acrylics unstable when subjected to high levels of short wavelength radiation; this type of energy is absorbed by the polymer, and if in large enough quantity, will break down chemical structures causing the plastic to yellow, craze or fog. However this should be a consideration only when the acrylic is exposed to artificial, high-intensity, short wavelength ultraviloet light. Natural sunlight is filtered through the atmospheric layers, so that at sea level there is practically no ultraviolet light below 300 nm. The remaining ultraviolet light (between 300 and 400 nm) is sometimes referred to as UV "A" rays. The "B" and "C" rays are lower than 300 nm and these rays not only break down plaqstic but are also more harmful to human tissue. It is for these reasons that tanning salons most often use UV "A" fluorescent bulbs in their solariums. "Properties", Applications", "Availabilities" , "Approvals" and "Specifications" for the UVT Acrylic are at the bottom of this page. Looking for a Uniquely Cut Item, other sizes, or UVT Acrylic Tubing? "Properties", Applications", "Availabilities" , "Approvals" and "Specifications"
Unusual optical clarity Displays Rod: .500" to 4.000"
High tensile strength Models Tubing:1.50" I.D. to 15.000" O.D. defines performance criteria for safety glazing used in buildings, concerning impact hardness and degredation after accelerated weathering. Polycast acrylic sheet in thicknesses greater than 0.099 are certified as complying. define performance characteristics of safety glazing of passenger cars, trailers, trucks, buses and motorcycles, including (but not limited to) impact resistance, chemical resistance, abrasion resistance, flammability, weathering and optics. Polycast offers an acrylic sheet which meets the requirements for the National Sanitation Foundation. Food and Drug Administration's regulations concerning food contract applications as described in 21 CFR 177.1010 for all food types, including alcoholic beverages in room temperature or refrigerated applications. Approved under Section 203 and 204 of the South Florida Building Code governing the use of Alternate Materials and Types of Construction. Underwriters Laboratories recognized for flammability* of plastic materials for parts in devices and appliances. Polycast acrylic is recognized under UL 94HB, with some exceptions. Underwriters Laboratories classified for surfaces burning characteristics of a building material. Polycast acrylic 3/8 inches and greater is classified with the following test values: flame spread = 140; smoke developed = greater than 500. Underwriters Laboratories recognized for polymeric materials in electrical applications. Contact inside sales for further information. • Level 1, MP 1.25, SAR MP 1.25 Medium power, small arms resistant. • Level 2, SAR HP 1.25 High power, small arms resistant. • Level 3, SP 1.25 Super power, small arms resistant. defines the flammability requirements for acrylic windows and signs for aircraft interiors. Polycast sheet .049" and greater meets this requirement. defines burn rates of interior materials for passenger cars, trailers, trucks and buses. All Polycast materials meet this standard. defines the requirements for materials used in the fabrication of windows for service in pressure vessels for human occupancy. Polycast material meets these requirements. Shipboard application of illumination and signal lighting. Defines the requirements of the material intended for use in the fabrication of lighting fixtures for Naval service. Among the associated tests are flammability, deflection temperature, flexural strength, impact strength and optical properties. Polycast material meets these requirements. Accepted for use, City of New York, Department of Buildings, as glazing material in lieu of glass in non-rated windows, doors and in skylights in sheet thicknesses up to 3/8" maximum, and for ground, wall and roof sign combustible material, where permitted by Code. File number MEA 80-82-M.
Approved for use in safety glazing applications. Calendar number 1997-61-SM. Polycast acrylic sheet .080 and greater complies with the requirements of the Consumer Product Safety Act and the CPSC Safety Standard of Architectural Glazing materials, 16 CFR 1201 for both Category I and Category II. defines physical properties which acrylics should meet or exceed, such as tensile strength, refractive index, specific gravity, deflection temperature, and impact strength. Polycast acrylic sheet meets or exceeds the requirements for all types of grades of sheet of this specification. A specification covering monolithic methacrylate sheet produced by the cell-cast method. Polycast acrylic sheet in thickness .030-4.250 meets or exceeds the requirements for Category A-1, finish 1, 2, 3; Types UVA & UVT. An S.A.E. material specification referencing specific Federal quality standards and ASTM test methods. Polycast acrylic sheet in thickness 0.030-4.250 meets or exceeds the requirements for item A, Type I, II and III, Grade A, B or C.
military specification covering modified acrylic (specially designed for superior resistance to chemical attack). Materials supplied for conformance to this specification are Polycast Poly-76® and Poly-84® (available in both Type I and II and Class 1 and 2). All products are on the Qualified Products list for this Mil-Spec. military specification covering stretched acrylic sheet specially designed from Mil-P-8184 base material. It offers enhanced craze properties and increased crack resistance. Material supplied for conformance to this specification is identified as Poly 2000™. military specifications covering heat-resistant, preshrunk, clear, and colored acrylic sheet. Material supplied for conformance for this specification is identified by the name POLY II®. Polycast is qualified to furnish sheets in thickness 0.060-1.000 to meet this specification. There are many more standards, codes, and specifications to which Polycast can demonstrate compliance. Inquiries regarding your particular problems or requirements should be directed to the Polycast Marketing Department. Call 1-800-243-9002 or email polycast.marketing@spartech.com. *This term and any corresponding data refer to typical performance in the specific tests indicated and should not be construed to imply this material's behavior under actual fire conditions.